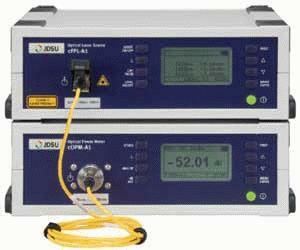 The JDSU Compact Photonic Tools offer a new portfolio of point solutions for fiber optic test applications. The cOPM-A1 Optical Power Meter is optimized for a number of applications ranging from general lab use to test and process automation for passive optical components. It can be used with both single-mode and multimode fiber and offers power levels from 80 to +15 dBm over a wavelength range of 800 to 1650 nm. The cOPM-A1 features high accuracy, high linearity, and extremely low polarization-dependent sensitivity. types, as well as a fiber holder that permits bare fiber measurements. The cOPM-A1 Indium-Gallium-Arsenide (InGaAs) Optical Power Meter has a FC connector detector adapter as a standard accessory and an optional integrating sphere, which may be fastened to the front panel for increased power measurements to 33 dBm (2 W) with decreased polarization dependent loss (PDL) to 0.005 dB. A simple, intuitive graphical user interface (GUI) and keypad minimizes training requirements. A universal serial bus (USB) interface may be used for test automation interfacing to a PC.While connected by USB, the cOPM-A1 does not require an additional mains connection, reducing cord tangle. The unit comes equipped with internal battery backup for quick measurements around the lab or for use during power outages.